Saigon on Fifth - mmm-yoso!!! You know how sometimes you drive past a locale, noticing the new signage, making a mental note to make sure to try the location out....then immediately forgetting about it? Well, this is what happened with Saigon on Fifth. Until Calvin sent me an Email mentioning His visit to Saigon on Fifth. Geez, (immediate slap to the head) how could I have forgotten. The location on the corner (sort of) University and Fifth has been a kiss of death for various restaurants. First a Rubio's went down in flames, then a pizza joint called Me N' Ed's lasted a few years. Since our office is within walking distance I decided to head over for lunch on a recent afternoon. I walked in and, oh my, the decor! I must say, I've never been in a Vietnamese Restaurant that looked quite like this. Very nice and upscale, though I must say that the first thought that entered my mind was "well, somebody has to pay for all of this....."
I looked at the menu, and knew instantly who pays for all of this.........guess? Now I expected maybe a bit more shrimp, or a really refined spring roll, but these were very small, and there were only two small "rolls". There was a bit more pork then usual, but because the rolls were kind of short on vermicelli and lettuce, the pork made the rolls seem very dry. I can get better from Vien Dong market for like 3 bucks for 3. Now, I had also wanted some nice strong Vietnamese Coffee, but was told they didn't serve coffee, which was fine with me. 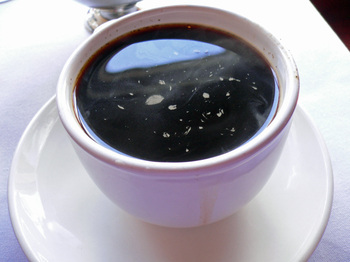 But just to illustrate the level of service(maybe a bit too attentive), they managed to brew me a nice strong cup of Vietnamese Coffee, which with a touch of condensed milk, really did hit the spot. I had never thought that I'd see the day, 8 bucks for a bowl of Pho'! It arrived in a pretty cool, but kinda small "casserole" bowl bolted into a wooden frame. Style points for the presentation, and for being served piping hot, but minus points for the garnish, consisting of a slice of lemon(!!! ), a small amount of bean sprouts, and the most pathetic looking sprig of basil I've ever been served. To be fair, I asked for, and was given more basil. Also minus points for 3 tough, rubbery meatballs. The amount of noodles was about half of a usual bowl of Pho' as well. What was really interesting, was the broth. For a restaurant that seemed to want to "safely introduce" Vietnamese cuisine, the broth had quite a bit of oil. Enough to coat the back of my spoon! 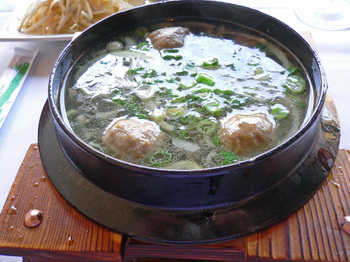 Other then the oil content, the broth was a medium to light Pho' broth with a mild anise flavor. Let me say that the service was very good, though maybe a bit over-attentive, but that's to be expected at a new restaurant. Other individuals that have eaten items like the Lemongrass Chicken, and other items, have said that the dishes are good, though the portions small, and rather over-priced. Rather then to go into any more detail about my meal, I'll let you draw your own conclusions. In fact, I think Calvin says it well: "The kind of dimly lit, classy place you could take your boss for something exotic without risk. Nothing funky, nothing chewy, nothing to offend your blue-haired aunt. Service is fawning, but they're still working out the bumps. Pho is rich, but so tame." Calvin should probably do the writing for this blog, he can describe the entire restaurant in less then a paragraph! Calvin, you da' man!!! Just had a sample from there during the "Taste of..." on Saturday - some sort of medium spicy chicken in a thin brown sauce. Overheard a few people thought it was too sweet - I liked it. Full report of the day (with pics) on the way as soon as I write it up. 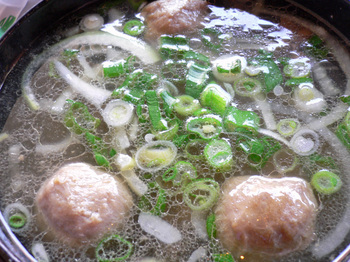 The meatballs even LOOK rubbery - but I like how they're arranged in a perfect triangular formation. lol! What a shame! $8 for that! I take the bus past this place every day, and I recalling thinking weeks ago, "Is that new vietnamese place trying to be upscale? Too bady Kirk would never bother to review a place like that." You've surprised me yet again! Hi Scott - Look forward to your post. Honestly, I can get much better food down on University, Linda Vista, Convoy, or Mira Mesa at much cheaper prices. Though the service was very nice. 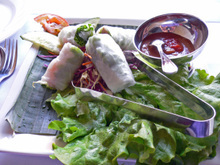 Hi Kathy - Now if this place would even try to be really upscale in any way besides decor and presentation - those spring rolls look mighty lonely, and attempt to really "do" smething with the food - I'd be very impressed. Hi Joseph E - Celadon used to be our favorite Thai Restaurant, especially when Alex Thao was around alot more often. Since starting the blog I haven't been back there. I won't even get into what I think about Taste of Thai. I just wish that the food and the dishes are brought up to the same level as the decor. A for living up or down to decor - we still like to grab some Beef Souvlaki/Gyros Sandwiches from Alexis Greek - at last visit still $2.99, and take them with us to picnic with at the zoo. I wonder what the mission statement of the restaurant is? Hi Jeni - Thats nearly 4 Banh Mi! BTW, have you been to Quon Hop on Brookhurst? I heard that the restaurant was trying to use higher quality products for their dishes. Upscale or downscale even this pho beginner knows that it's just not the same if you don't get a whole lot of greenery to go with it...wow, only one measly sprig of basil...the mind boggles. Kirk, thank you for recommending Alexis Greek. I've seen that place but never thought much of it; it would be nice to have a good Mediterranean lunch for a change. I don't think you've ever posted about that place before (and Google agrees). Is it on your list? A /slice/ of lemon? Oh dear, how sad. Doesn't look like I'll be lured away from my nearby City Heights pho place anytime soon. 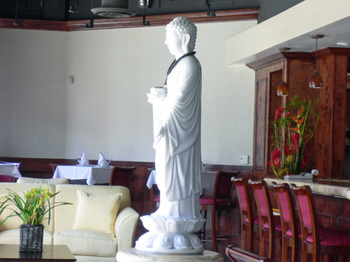 Celadon and Kitima are our favored Thai restaurants in Hillcrest. The whole fish preparation at Celadon is very tasty although not cheap. Have you been to the new Golden Dragon yet? Hi EmilyK - I like the term "greenery", LOL! And yes, it is a pretty pathetic little piece of basil. Hi JosephE - Well, I wouldn't call Alexis a "good" Greek place - but it is inexpensive and you get your money's worth(caveat - we haven't been there since last year). This is what we like to do at Alexis, when the SDZoo starts opening evenings, we'll drop by Alexis and order 2 beef souvlaki and 1 Gyro sandwich to go, and take it with us to the zoo and have a evening picnic, and then cruise around the zoo to burn off those calories. BTW, for Mediterranean Food - I thought Garden Grill was pretty good - and since our offices are in Hillcrest, Mediterranean Cafe was also pretty decent - they both always have coupons "floating" around. "....Rather then to go into any more detail about my meal, I'll let you draw your own conclusions." I thankx you....the Internet thankx you. It's apparent that the restaurant has flair for Louis da 14th Versailles decor....french influence carry-over from the Vietnam colonial period, perhaps, or at least a rendition of. My hubby and I were wondering- is this restaurant owned by the same folks as the one on El Cajon Blvd across from Hoover HS? 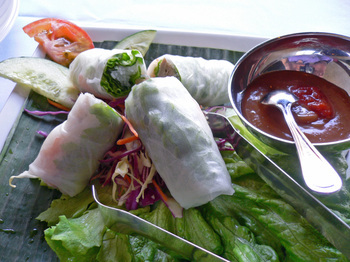 If so, those spring rolls just look so measly compared to the ones they have @ the El Cajon Bl location! It doesn't seem right to pay almost $8 for a bowl of pho, no matter how cool the presentation is... but, I do hope that they manage to last for a while. $7.95 for Pho' ?!!? But wait, there's more...with that you get one sprig of basil and one special lemon slice....Unbelievable. I guess you had to try it since it's just a couple of blocks away from work. 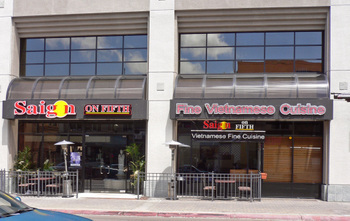 saigon on fifth should not be confused with a pho kitchen. 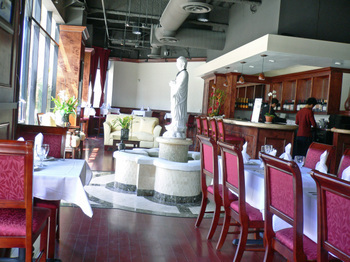 it is a fine dining restaurant and is very reasonably priced as such. we found the service to be excellent and the food devine. the staff is well dressed and very pleasant. 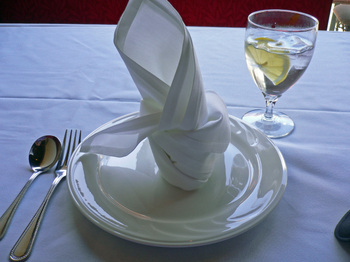 all the dishes are authentic and beautifully prepared and presented. Hi Bill - Hmmmm, where did I say it was a Pho' kitchen? The Slanted Door in San Francisco is fine dining Vietnamese. 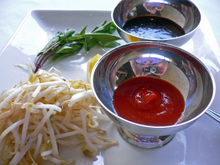 Though the service is excellent, and the food is presented well, I'm not sold on Saigon on Fifth. Mainly because the food does not warrant such a definition; it is neither higher in quality nor ingredients, and not in flavor. It would seem that you appreciate well dressed staff and nice presentation over food, but I do not. So I guess though Pho' is on the menu, one should not order it, then? The first poster should really try to grasp the diference between "than" and "then"
Hi Crossbreed - Thanks for dropping by and commenting. You should be able to grasp the difference between a blog and a true journalistic effort. Sorry, had to say it! Thanks for this write up.. far more decisive then whats on SignonSanDiego.. so we will be visiting in a few weeks and would like to know the names of your favorite Pho/Banh Mi places in SD.. I agree with all of you about the mediocre Pho at Saigon on Fifth. But I think you all missed a major point in Vietnamese cuisine. Unless, it says "Pho" in the restaurant's name, it AINT a Pho joint! The best food at Saigon on Fifth is probably the Bo Luc Lac (shaky beef? 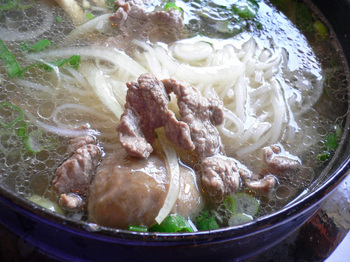 ), not the Pho. Basically, Saigon on Fifth caters to the upper class eaters, so you'd best try to eat "upper class" dishes. Look for the "Fine Cuisine" part of he restaurant label, lol.